Thread: !HOMEWORK 2! 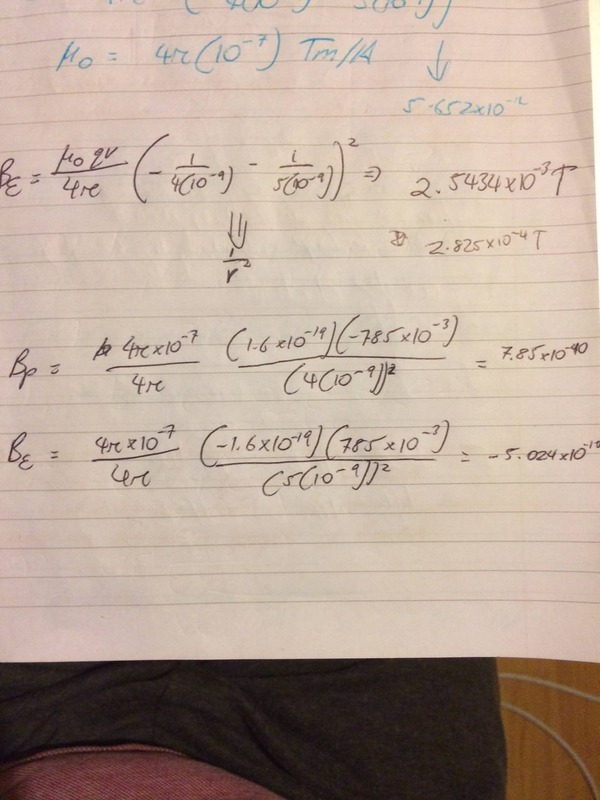 Electricity & Magnetism - Electron/Proton Magnetic Fields Question HELP! #1 !HOMEWORK 2! 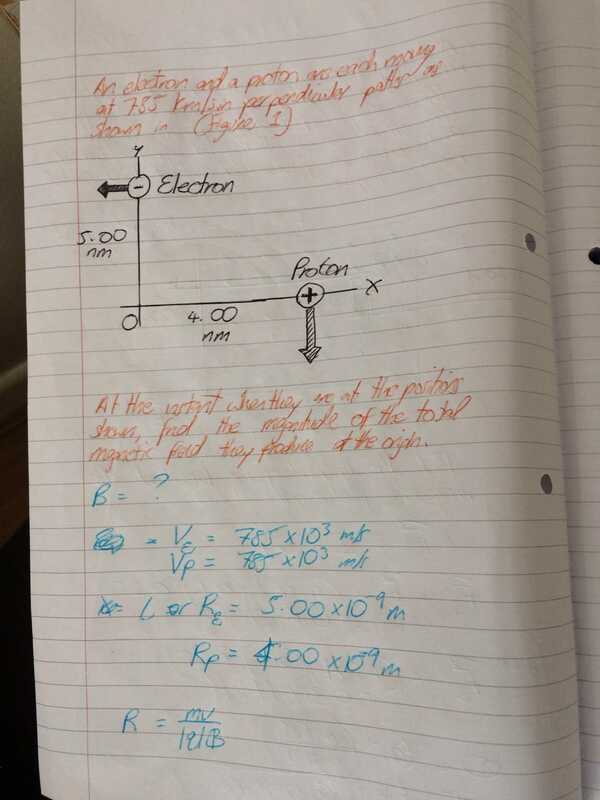 Electricity & Magnetism - Electron/Proton Magnetic Fields Question HELP! a.) At the instant when they are at the positions shown, find the magnitude of the total magnetic field they produce at the origin. b.) Find the direction of the total magnetic field they produce at the origin. 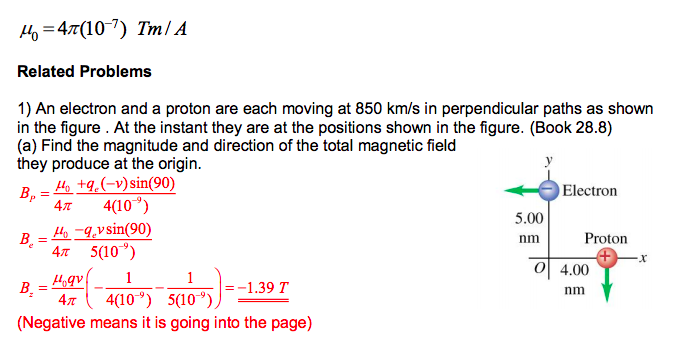 c.) Find the magnitude of the magnetic field the electron produces at the location of the proton. d.) Find the direction of the magnetic field the electron produces at the location of the proton. 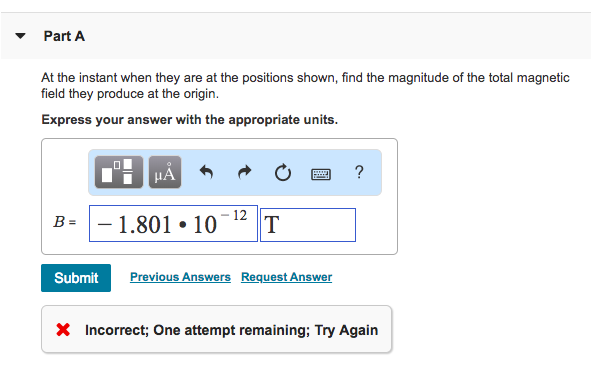 e.) Find the magnitude of the total magnetic force that the electron exerts on the proton. f.) Find the direction of the total magnetic force that the electron exerts on the proton. g.) Find the magnitude of the total electrical force that the electron exerts on the proton. h.) Find the direction of the total electrical force that the electron exerts on the proton. This is a lot btw, can someone help if possible because even I got the first part wrong and need fixing of it too. Then my second attempt when changing signs in the workings, -1.801x10^-12 is wrong too. CORRECTION: I forgot to square the radii or respective radius but unsure if it's correct. 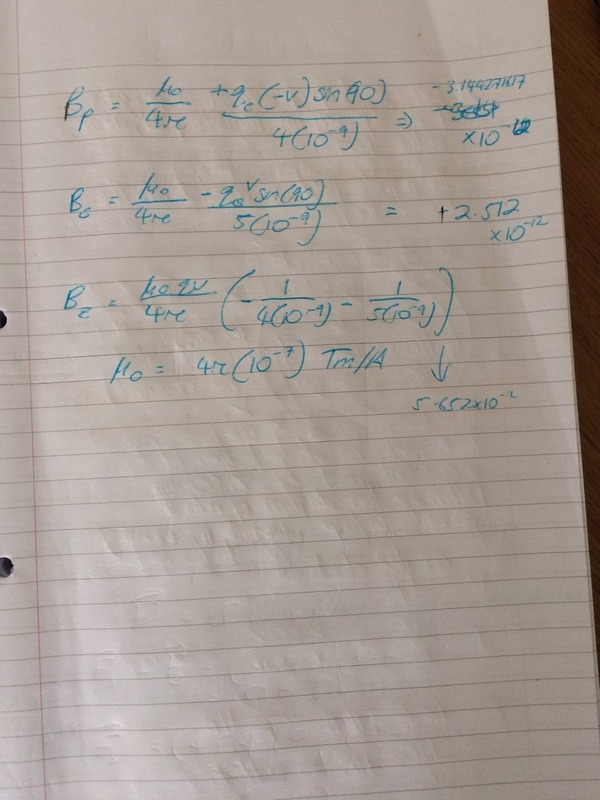 Somehow I did them seperately too to be sure but I'm getting different values for seperately or when I use the formula for them both as shown. So feel free to help me out btw! But not just for part a since it carries on and I'm unsure where to go. Thanks. You need to use the VECTORIAL formula because you will need to add two vectors. If you do the crossproducts correctly you will see that the inductions ADD up in the positive direction of the z axis. You need to square EACH radius, not their sum. You also need to start working with symbolic formulas, do the numerical substitution at the end, after you got the final symbolic formula. This will avoid a lot of mistakes and wasted time. 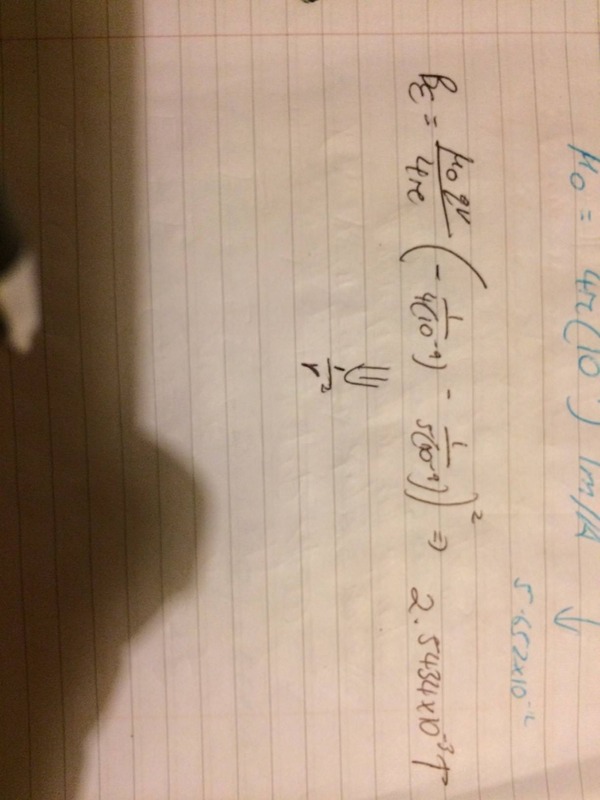 Thanks, I did what you suggested and got 1.2874x10^-3 T which is correct, as 1.29mT is the exact answer. I also found the direction of the total magnetic field produced at origin which is INTO THE PAGE. I assume you use Pythagoras' Theorem to find the hypotenuse from the figure, knowing that 5x10^-9 m and 4x10^-9 m are the other sides. 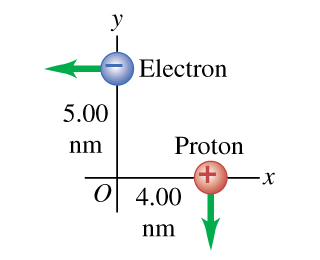 Then you use the same formula from Part A to find the magnetic field the electron produces at that proton location, but this time with the radius I should calculate from aboe?